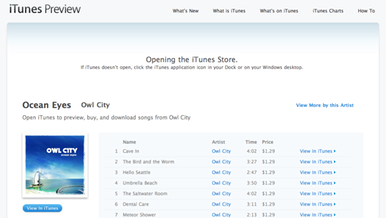 Links to an iTunes Preview page can be obtained through the iTunes Store "Copy Link" feature. Previously, users who did not have iTunes installed were prompted to do so in order to view content. Now, users can share music links via iTunes without the need to launch Apple's media suite. The iTunes Preview page allows browsing of artists and albums on Apple's Web site. Artist biographies and similar acts can be viewed, as well as details on song prices and individual track lengths. The new Web page also offers album reviews and customer reviews, just like is provided in the iTunes application. Content can also be browsed by genre. Song previews, however, can not be listened to through iTunes Preview in a Web browser. The page offers links to "View in iTunes," where it can be previewed or purchased. Currently, the service only works with music. iTunes Preview is region-less, and makes for a less intrusive option for those who do not have iTunes installed, or do not want to launch the application. In September, Apple released iTunes 9, adding iPhone application management, iTunes LPs, and a redesigned iTunes Store. The layout update includes new artist, movie and TV pages, complete with improved navigation. In October, Apple updated iTunes to version 9.0.2 to allow connectivity with the newly released Apple TV 3.0. Users can now view iTunes LP and iTunes Extras content via their Apple TV. Apple has been working with the web a lot as of late. This seems like it will be very useful being that it is web-based, perfect for those people who don't have iTunes installed on their computer yet (shame on you...). Is it just me or is the image provided by AI in the article down? If it is just me can someone provide an alternative link? Thanks. Edit : Seems to be fixed now. they going to block Palm from their site? Anyone know why some articles have a link at the bottom of them that lets you see the original story (with pictures and links), but some do not.....like this one? Where is the [ View this article at AppleInsider.com ] link? A tad pointless, who doesn't have iTunes? Seriously, those that don't would never buy from the service so whats the point? Maybe they have an idea that's going to build on it, but they're not ready to show their hand yet? People who are thinking of buying an iphone, itablet but want to see what apps are available before they do. They might not need itunes at that time. Unless I'm missing your sarcasm. It's the syncing that Apple took issue with, not the use of the songs iTunes holds. Yup pointless, unless there is some future developments to this story that we don't know about, having a list of songs on line, which you have to launch itunes to prview (and purchase?) is just silly. They could be trying to compete with amazon's MP3 service, but I still think it is way easier to just launch itunes, than navigate to a website and have limited functionality. Not everyone likes having iTunes launch just because they clicked a link. The time it takes to load up generally means I don't bother looking at whatever was linked. I just move on. I wouldn't be surprised if Apple makes the iTunes store more and more web-based -- eventually adding in-browser sampling and purchasing. There'd be little point in switching to html5 within iTunes if they weren't moving this way. Now, users can share music links via iTunes without the need to launch Apple's media suite. Does this mean that iTunes users can share access to their content with others (i.e. something like iWork.com)? There are lots of "points" if you think about it. Some are even mentioned in the article itself, which you apparently didn't read. This is all true if you are an American living in the USA with iTunes already installed. If you think about it a bit more you might see that this description doesn't cover everyone. Actually I did read the article, I can see no benefit in this at all. To purchase/listen or interact with the content in anyway you need to launch iTunes. I am sorry, but apart from the fact that you could potentially follow an iTunes link without opening the application (and once again cannot even listen or "preview" the track or moive etc containted within said link) I stick by my comment, I do not see the point of this. No one who does not already have iTunes on their PC/Mac would have any need of this. If you feel I am wrong then highlight some reasons that I am. Apple needs to make iTunes store browser based. This preview hybrid is annoying. Also easier to just go into Amazon and buy a song than open up iTunes just for shopping media. hah! someone at AI a Lightnight Bolt fan?